But, no pity, I have no need of pity! I had a CT scan and a visit to the oncologist this week, and, three months after my metastatic recurrence, I am free of detectable cancer! Life goes on. Really. So, here it is, time to write a blog post, and there’s nothing in my head but stray thoughts, ideas without coherency, and nary a story that isn’t mostly off-limits due to medical privacy constraints. So, here is a rare stray story that isn’t medical. On Sunday, just as the cyclone was clearing out, I was coming back from a relatively routine trip to our nearest hospital, twenty-five minutes away, as part of a three-person ambulance crew. (My town is surprisingly rural, on the outer fringes of the northern New Jersey suburbs, twenty-seven square miles of steep, forested hills, reservoirs, and lakes, without a single traffic light or any roads with more than two lanes.) When we got into town, coming over the small mountain that separates us from civilization, we started cross-town to the DPW yard, five miles past the ambulance building, to get fuel. 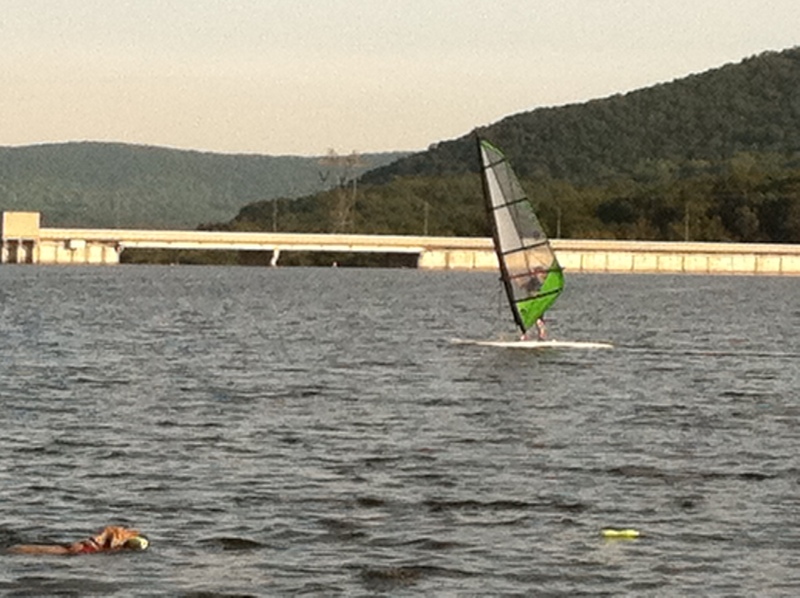 As we passed the turn-off for the ambulance building, one of the volunteer fire department officers got on the radio, reporting that there was a windsurfer on the Monksville Reservoir, near the dam’s spillway, and apparently in trouble. 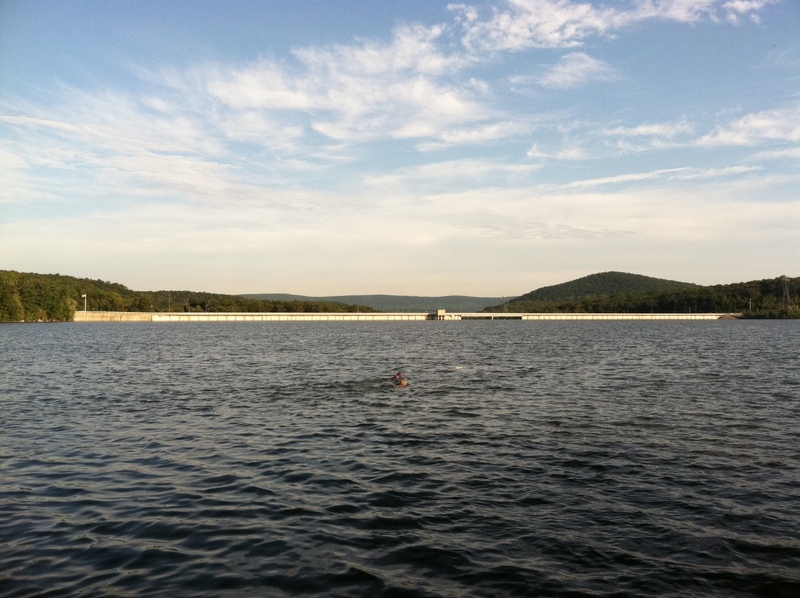 The Monksvile Reservoir is a fair-sized lake, and the Monksville Dam is huge by east coast standards; more than a thousand feet long, over two hundred feet high, with a two-lane road on top. There’s a small parking lot at one end for sunset gazing. Near the middle of the dam, there’s a spillway, where the overflow spills the two hundred feet to the rocky stream bed below. In the wake of the cyclone, the current pulling toward the spillway would be as strong as the tides at Fundy. The Monksville Dam on a calm day. I don’t think it took us five minutes to get there, since we were already on the road and pointed the right direction, but when we pulled up at the parking lot at the end of the dam, the fire chief, the rescue truck, and a few cops were already there. (The whole fire department had been working since the day before on storm-related emergencies, and wouldn’t get home for at least another day.) It wasn’t raining, but the sky was grey and low. As I stepped out of the ambulance, a powerful wind slapped my face. Two firefighters were pulling on a taut rope that was over the railing. I crossed the parking lot to the railing, just above where the lake touches the shore. The surface of the lake was whipped to a froth of three-foot chop, and as I approached the railing, the spray off the lake hit me like a shower. In the water at the end of the firefighters’ rope was a man in his fifties – my age – with short grizzled hair and beard, wearing a black wetsuit and clinging to a wind surfboard, its sail folded flat on the water. He was being towed ashore, where two more firefighters waited below me. He climbed out of the water without difficulty, and, escorted by the firefighters, walked up the bank to where it reached the top of the dam. I watched carefully for signs of injury, but there was only resentment in his walk. “Wait here a minute.” Kevin walked away. I smiled. I didn’t tell him I’m a retired cop, and I didn’t argue or suggest that there are more significant oppressions to worry about. But there’s a point to be made here about living in community, love of neighbor, and selfishness, and Kevin has already made it. This entry was posted in Cancer, EMS, Police and tagged blogging, cancer, community, EMS, firefighters, Hurricane Irene, love, police, rescue, windsurfing. Bookmark the permalink.